Today, there are about 165 million websites live on the internet... And if you see analytics for any website you'll get to know that about 75% get less than 5000 page views each single month. You don't need to be a mathematics geek to figure out that it amounts to approximately 150 page views each day. The three most important words that you have to bear in mind while running any online business is this; You need TRAFFIC! But before you rush off to that traffic exchange website that you have been hearing off or start buying bot traffic, you should know that all traffic is not equal. Always strive to get traffic from real human visitors. And with a little effort, make it targeted. Targeted traffic is a high-quality traffic. And it's the type of traffic that brings in a huge amount of money. If you track website hits for popular pages, 1000 targeted visitors will always convert better than 1,000,000 traffic from lifeless bots. What is Geo-targeting? The geotargeting is nothing but publishing the content on your website to your readers based on his geographic location. The use of geotargeting ads can be used to target locals through Geo targeting adwords, paid (PPC) or organic search. Moreover the targeting and retargeting ad placement help not only to increase Adsense earnings significantly but also provides the solutions help brands reach the targeted organic traffic. For better use, the Geo targeting wordpress plugins are available for self hosted blogs. If you looking to improve visitor stats for websites then you have reached the right place. Learn more to get more traffic to your site. And while writing those posts, I got to share the blogging idea about Geotargeting that I was working for from the last couple of months. And I got great results by this geotargeting the website. This page not only help you boost your organic traffic but to drive the attention of the quality audience. Check out how geotargeting help you to build a right audience to your site. You should know that the best way to increase your website conversion is to target the audience in a particular country that has been proven to perform well. 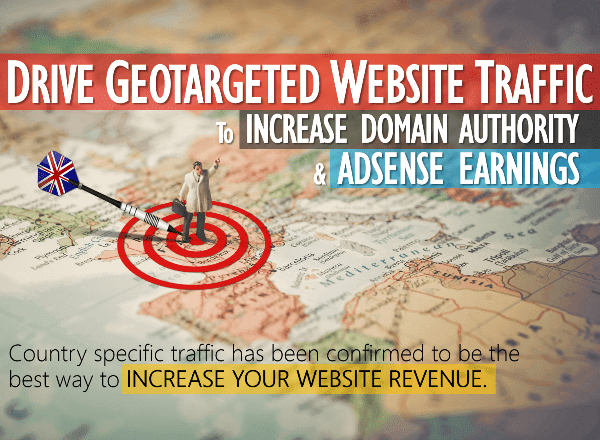 Country specific traffic has been confirmed by various researchers and case studies to be the best way to increase your website revenue. You probably already know by now that traffic from US, UK, and Canada convert better in terms of advertising and affiliate sales. This could largely be attributed to the high standard of living of the people living in those countries. 1. Perform a local keyword research. If you have been in blogging business for a long time, you must have known that SEO is a game of keywords. In order to get visitors from a specific country, you need to find out the words that they are typing into search engines for that particular country. The best way is to use web traffic monitoring tools to monitor what your target audience is searching for is to use a keyword tool that filters search queries according to the countries. This will provide you with golden keywords with high search volume that could drive a flood of visitors to your blog. An example of keyword research tool that you could use for this purpose is SEMrush. Another strategy that could prove to be quite useful is the addition of country names (or a place within the country) to the end of your keywords. This will enable you to rank high on Google for those keywords when they are searched by your country specific targeted audience. Going further, Google Trends is another valuable online tool that you should use. It enables you to find keywords that are currently trending on Google Search according to different countries or locations. If you publish an article on any of the topics that you were shown, the number of visitors from that country to your blog will skyrocket. 2. Buy a country-specific domain name. Country-specific domain names are domain names that have the shortened form of a country's name as its extension. If you have any of these ccTLDs (country code top level domain) extensions, you are guaranteed to perform well in the search result pages of that particular country. Using generic or top level domain names (TLD) will not get you to the top spots in the local search engine versions of Google. You have to use the country level domain in order to gain enough search traffic. The country level domain name that you choose is dependent on the country that you are targeting. For instance, if you are targeting Nigeria, you need to buy a domain name that ends with .ng. If you want to know how to increase US traffic on the website then you need to have a domain which has '.us' extension. 3. Buy website hosting plans from servers located within the country. The best way to tackle this is to ensure that the server hosting your website is located in the country of your choice. If the visitors that you are targeting are in U.K, you should find out the best website hosting company in U.K and buy a plan. It is recommended that you look out for the uptime of the servers of those web hosting companies before buying. This is because of the fact that a server that's down sometimes will affect your rankings a lot. If you host your website in one of the servers within the country, your website loading speed will be faster and Google will understand your website more. 4. Gather backlinks from blogs in the country. Up till now, link building still affect the way websites are ranked on Google search result pages (SERP). And according to Google, backlinks serve as a vote of trust given by a website to another website. So, the only way to become a trusted source in the eyes of Google is to publish highly resourceful content in your niche which encourages the Linkerati (a Moz.com word for followers of an authoritative blog) to give you dofollow links. If you have a lot of backlinks from a lot of blogs hosted on Nigerian servers or with .ng country level domain names, you will notice that you will be ranking #1 for that very keyword of the blog post. In order to secure these highly valued backlinks, you need to get out and connect with other bloggers. And join communities. To become known in their community of bloggers, leave useful comments on their blogs and answer questions from newbie bloggers. Before you know what's happening, they will take you as an expert in the field of blogging and will give you high-quality backlinks that will take you to the top. 5. Make use of Google's geo-targeting tool. Google has a very valuable tool called Google Geotargeting Tool. This can be found among other amazing tools on Google Search Console (formerly called Google Webmaster Tools). The main function of this Google Geo targeting is to enable webmasters to decide which country they want the search engine bots to rank their website for. To access this tool, all you to do is visit Google Search Console, click on tools and then click on configuration. You will then see an option for you to choose the country which you want your website to target. 6. Create an ad targeted at people living in the country with a Facebook atlas or Google AdWords. This method works so well for those running e-commerce websites. Depending on your website advertising budget, it could get you tons of traffic and buyers from your target audience. But for better geotargeting marketing the content bloggers should steer away from this method of the country targeted traffic because it will be difficult for them to recover the cost of their advert campaigns that use geo targeted mobile ads too. Online store owners who have no idea of how to set up Geo targeting Facebook and AdWords ad campaigns should never attempt it. The best thing to do at this point is to hire experts from multilingual SEO agency to set the ad campaigns so that they will become profitable - with ROI. Well, this is it for this particular post. If you’ve got any other way of getting traffic from a specific country, I’d love to hear them in the comments. Article By Ozeh Lawrence - He is an innovative blogger and his main areas of interest is writing quality contents for enterprises and small businesses. With the few years of experience in digital marketing, he enjoys supporting smartpreneurs like himself achieve online success.